Railways Minister Piyush Goyal visited the accident site and ordered an inquiry by the Commissioner of Rail Safety. 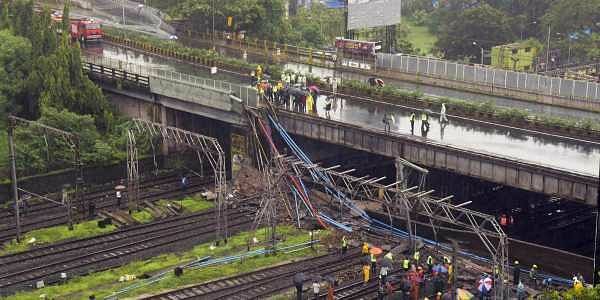 NEW DELHI/MUMBAI: Barely seven months after it was inspected for structural safety, the Gokhale overbridge at Andheri railway station in Mumbai collapsed on Tuesday disrupting train services and injuring five people. Railways Minister Piyush Goyal visited the accident site and ordered an inquiry by the Commissioner of Rail Safety. The report into the collapse of a portion of the 47-year-old overbridge due to heavy rains, will be submitted within 15 days. Expressing regret over the accident, he said it was “very unfortunate” and “most unexpected”. Goyal said that during the next six months, a joint safety audit will be conducted by the Railways, the Brihamumbai Municipal Corporation (BMC) and the Indian Institute of Technology, Mumbai, at the 445 road overbridges, foot overbridges and bridges over pipelines in Mumbai as part of efforts to improve safety for the commuters. He said around 700 employees of the railways, helped by some experts from Delhi and Lucknow, were working on the restoration work and the train services will be resumed completely soon. A spokesperson of Western Railway said that “no structural flaw was found in the audit” that took place in November 2107 along with that of 2,000 other bridges and 550 ROBs.A part of the 47-year-old Gokhale overbridge came down at 7.30 am, before the commuter rush hour had started, which was the likely reason the casualty figure remained low. Normally, thousands of commuters use the bridge, which connects Andheri East and Andheri West stations. The falling bridge entangled with overhead wires which fell on the tracks below, halting local train services on the Western line, officials said, causing immense inconvenience to Mumbaikars for whom local trains are a lifeline. Some long-distance trains were also cancelled or rescheduled. The fire brigade rushed into action and efforts are on to clear the debris as well as do away with any dangerously hanging parts of the foot overbridge. The injured individuals have been sent to hospitals even as heavy rains hampered the operations, fire service department sources said. According to railway officials, services between Virar and Goregaon at the northern end and between Churchgate and Bandra on the southern side were on. Officials also said that the traffic between Bandar and Goregaon can't be restored till the tracks are cleared of debris and the overhead equipments restored. Mumbai: In Mumbai’s suburban Andheri, a major tragedy was averted by an alert motorman who applied the brakes in time, stopping his train a few metres away from the site where a portion of a foot overbridge had collapsed on Tuesday morning. Chandrashekhar B Sawant was steering the Churchgate-bound train from Borivali and on nearing the Andheri station, he witnessed a part of the bridge falling. He immediately applied emergency brakes, bringing the train to an abrupt halt.